Here in multicultural BC, Chinese New Year arrives with a traditional combination of family, fun and fireworks. We’re getting into the spirit with a lucky offer for all of our customers! 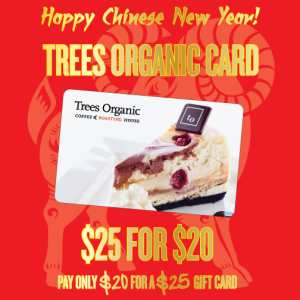 From February 12 to 19 at participating Trees Organic locations (Granville, Yaletown, Kitsilano and Richmond), get a $25 gift card for just $20! You can use your gift card to purchase anything in the cafe, such as our line of teas from around the world, cookies or one of our delicious cheesecakes to add a sweet surprise to your traditional family gathering. Get a gift card for good luck this season. Don’t forget to register it for added security and extra perks. Gung Hay Fat Choi! Offer valid February 12-19, 2015. Valid on new card activations only. Not valid with any other promotional offers. This February, we’re still serving up some amazing coffeehouse musical entertainment along with our award-winning cheesecake and organic coffee beans. One performer we’re especially looking forward to hearing live is Cameron Hawes, a talented pop, blues and folk-influenced performer from the east coast (They sure have more than their fair share!). We caught up with Cameron and got the inside track on the music and the man. 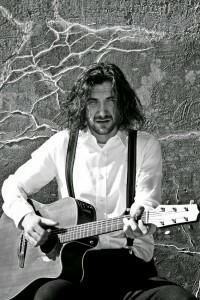 You can see him perform live at our Granville Street cafe on February 20th at 8pm. TO. You’ve been working on an 11-song album. Can you give us any details? What’s inspiring you this time out?